The official aid agency of the Catholic Church in England and Wales and part of Caritas International. Across the world we bring hope and compassion to poor communities, standing side by side with them to end poverty and injustice. We work with people of all faiths and none. Inspired by Scripture and Catholic Social Teaching, and the experiences and hopes of people living in poverty, CAFOD works for a safe, sustainable and peaceful world. Together we pray, act and give to help our brothers and sisters living in poverty around the world. This parish supports CAFOD, raising funds each year through the Fast Day collections (Harvest and Lent), emergency appeals, Lenten lunches, and a range of other prayer and social events. CAFOD works in partnership with agencies of the Catholic Church across the world. Because of these partnerships, between this parish and overseas partners, CAFOD keeps the cost of raising money low, making sure we can help more people. The Society of St Vincent de Paul is an international, fraternal organisation of Catholic lay people who practice their Christianity by helping those in need on a person to person basis. 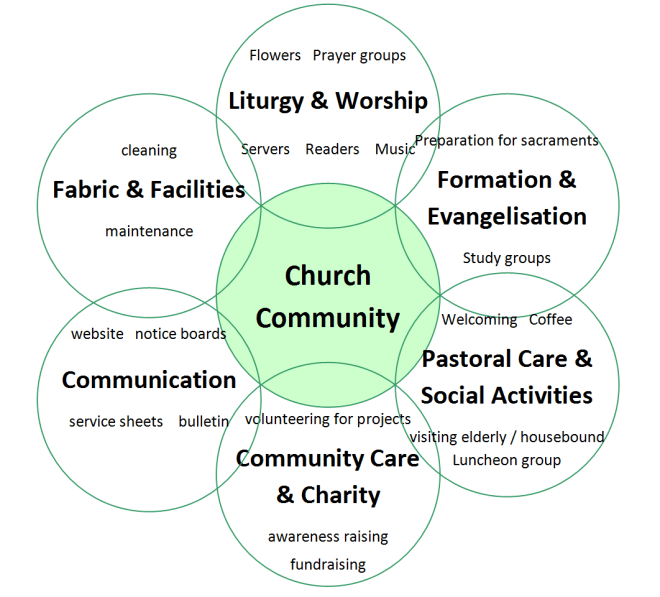 The members meet weekly, firstly to support their efforts by prayer, and secondly to assess the needs of the poor in their particular area and how on a practical basis to meet that need. The society encourages self-help projects.